A darkened form of cane ware made to simulate bamboo. 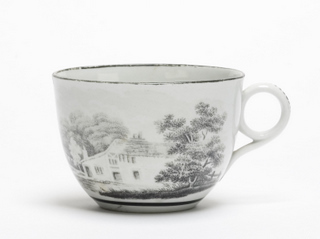 It was developed at Wedgwood around 1770. Also known as Bisque, describes unglazed ceramic wares that have been fired once. A manner of painted geometrical decoration produced in a typically Art Deco manner. This was developed and made popularly by Clarice Cliff. Fully formed but undecorated porcelain also referred to as being “in the white”. A female urinary receptacle. There is an unfortunate tendency amongst the uninformed to mistake such articles for sauce boats. An earthenware or porcelain flower pot on stand used to house a smaller less decorative and entirely utilitarian plant pot. A line usually incised, struck through a factory mark to denote a flawed or discontinued product. Such pieces were often sold as factory seconds. A manner of later decoration added to Chinese export porcelain in mainland Europe. Enamelling and gilding would be applied over-glaze to previously considered finished wares, which were generally decorated with under-glaze blue decoration. A Neolithic Chinese vessel purported to be a symbol of the Earth. The area left unglazed round the base of porcelain figures. Chinese decoration using bright green enamel work. Chinese decoration recognisable in its use of bright opaque pink enamel work. Marks and decoration applied to pottery or porcelain before glazing. 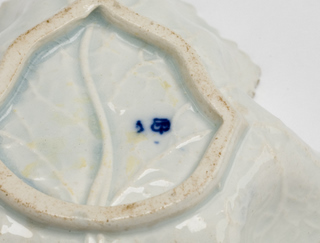 Cobalt blue is by far the most common under glaze colour encountered. Refers to fully formed items that are ”Leather Hard”, which means that they are not yet dry enough for firing. The background colour of a decorated ceramic item. Usually in one colour known as monochrome. Literally “House Painter” in German. Such individuals decorated bought-in undecorated blanks. Such Hausmalerei wares were produced in what is now Germany during the 18th century. The name given to British and European factories and warehouses located in mainland China, often related to the manufacture, storage and export of porcelain. “Built up” enamel decoration applied over gilding to simulate precious stones in cabochon form. Often referred to as China Clay. A fine white granite clay and an essential ingredient in Hard Paste porcelain. Refers to Porcelain used as ships ballast. An urn shaped two handled cup. 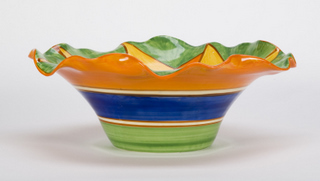 Is an Anglicisation of the Italian “Maiolica”, which refers to Tin and Lead glazed 19th Century Earthenware known for its exuberant colour and form. Wedgewood, George Jones and Minton are generally regarded as the finest manufacturers of Majolica. The name given to ceramic decoration applied wares that have already been fired and glazed. This manner of decoration is generally finished when the piece is re-fired in an enamel kiln. The initial material from which the body of porcelain is made. Decoration executed in more than one colour. The repairer was the skilled worker whose job it was to assemble all the mould components of a figure or object, and prepare it for firing. Refers to clay which is still in a liquid state. An Italian method of using a stencil to decorate blue and white porcelain. A technique to effectively mass produce an image or design onto porcelain. A copper plate would be loaded with a ceramic pigment, which is then stamped onto paper via a press. Whilst the pigment is still wet the paper is applied to the unfired porcelain surface, thereby transferring the printed design onto the surface of the pottery or porcelain. Our expert’s guide to the terms you will see as you collect and deal in Ceramics.